Or how to promote a spanish film frightening away the tourism. Welcome to France ! I couldn't miss it while in Paris, and even more when they chose La liberté guidant le Peuple de Delacroix for their album cover. It would be a long chronicle and it seems to me that the nights are getting shorter, so lets just post some videos. Stephen Clarke is a British journalist and writer working for a French press group in Paris. 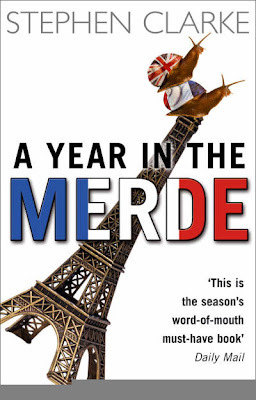 A Year in the Merde is an almost-true account of things that may or may not have happened to him in the ten years he has lived in France, depending on who is asking the question. He originally published the book in an edition of 200 copies, with the intention of selling them through his website, giving them away to friends or offering them as fuel for his neighbour's Bastille Day barbecue. However, after a reading in a Canadian bookshop in Paris and a write-up in a French newspaper, the book turned into a surprise hit. He has previously written comedy sketches for BBC Radio 4 and jokes for a stand-up comedian. He is currently working on the next volume of Paul West's adventures. Stephen would like to thank the French government for introducing the 35 hour week and giving him time to do more interesting things on Friday afternoon than work. Merci. The date is approaching. The bigger the quantity of work I get, the lazier I become. The closest the end is, larger the number of posts I think of, and fewer the words I can articulate. Sometime in between this long summer I thought of writing about my favourite plans in Paris. I was discouraged by the idea of the Lonely Planet syndrome, thinking that somehow, my favourite and secret places would be spoiled. Unfortunately the are not that many things to do in Paris that the mass of tourists and expats haven't discovered yet.. but tonight I go for one thing that surprised and filled me for the next week. Walking along the Hall of Mirrors of the Palace of Versailles in the sunset is closer to be one of the best plans I can think of. The usual visit is during day time, but you can book it for the evening (Le Parcours du Roi) from 18.30 to 21.30, on Saturdays during summer, experiencing what Marie Antoinette may have seen every evening. Today it was a long day: from tears to laughs, but finally Pablo came to this world surrounded by (almost) all the people that love him. I will be able to witness the miracle on Thursday, till then, here he is (let's forgive the photographer, his nervous grandfather) isn't he cute??? Luckily there is no end for the music scene in Paris. In fact, I could say the summer started with music. First concert in Madrid ;) and afterwards the Jour de la musique, widely critized and hardly never enjoyed. I have no recommendations for the future in such big event: just improvise! I was lucky to listen to a great trio just under my place which kindly got me. Have a look at the picture, just like that, in the middle of the street... what a world! Then, I kept with the musical mondays. 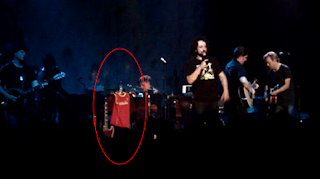 First with a big mistake, Counting Crows, just for the old times.. The only good thing was when somebody throw at them a tshirt of the Spanish football team and they seem to recognize and understand it ;) and played their Holidays in Spain. The weekend we went for Solidays, one of the biggest festivals in France, and then it came one of the most expected, Death Cab for Cutie. 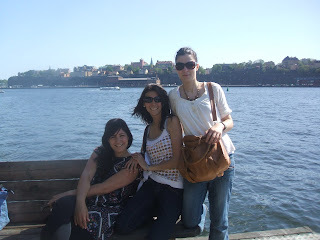 I always feel proud when I say: "I went on an erasmus when I was 22", it is like you said you went on a bizarre trip (and so it was) But I feel more proud when I say I still keep my friends from there! 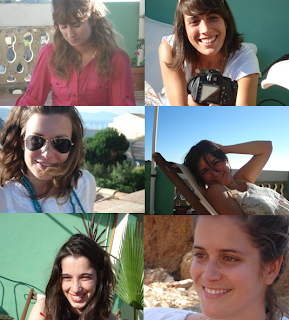 Some I have even been at their places: Thijs (Valencia), Al (London), Piet (Brussels).. when the wind takes me there. But there are some from who I get news every day. As any other group it is heterogeneous, it changes, both elements and relationships, but there is still something that sticks us together. I loved to get back with you to what we were three years ago and to what we had become. I loved to talk about future as we had never done before and I loved to laugh and hug you. I feel lucky to be in this part of the world and having been able to share this weekend with you. Esta mañana me quedé dormida (por fin!) me levanto y me pongo un vestido rojo para ir a la Oficina. Leo la muerte de la marmota y no puedo reprimir la risa. Qué felicidad celebrar una victoria así y que alegría me produjo experimentar la complicidad de tanta y tanta gente con la que me crucé ayer. Casí como si yo hubiera ganado el partido! París ayer fue español. Y los franceses demostraron como nunca que su antipatía por Alemania es mayor que su recelo a lo español. Y es que ayer España dio una lección, Europa no acaba en los Pirineos! Thanks to all of you who supported Spain and thanks too to all that didn't but thought of me and sent me some congratulations :) good to hear! Again, better late than never... here is my post about Sweeden. We got to Stockholm late friday evening, but there are no big surprises in such overdevelopped countries. Getting to Melani's was as simple as expensive and there we had tortilla, jamón, spanish wine and an awesome group of people waiting for us. Then we had our botellon over (literally) the lake, great great, no big surprise for some spaniards. I love civilization and I loved too not being able to enter any of the posh discos we tried to, money wisely saved. And then, a sunny sunday in a park. We had our BBQ assembled, just the american way and we spent the day there, in between baths, Absoluts and laughs. 11PM, a group of ICEX on a sunday night who bet to go out that night and actually do, isn't it surprising? It is, indeed, to leave the disco at 4am, with a complete open day, just as the summer nights I love in Spain. Monday morning: grasse matinée, which means sleep in till you wish :) and then a walk in the land of H&M, nice meal with my colleagues and back to Paris. No big stories, perhaps a couple of topics that died, but it was, without any doubt, one of the best weekends I had so far. Thanks to Melani, Maria, Eneko, Oscar, Javi and Adolfo, great great hosts, hope to see you in the future! And Starlight by Muse to end this post, cause I listened it back at Adolfo's after a long time and I really want to keep it in mind! I remember my first day. I tried it in the campus cafeteria and after some time I loved it. That time has an specific souvenir: the library in the UAM and the flavour of my lemon coke. Life was easy then. Afterwards I graduate from my MBA, thanks to Lili and the lemon cokes in the vending machine of Icade. Once, I even confirmed I was in love the day he came to pick me up at the airport with the biggest smile and a car full of cokes, ready to start our own roadtrip. And then.. it happened. First I thought it was going to be something accidental, but day after day, the shelf of the supermarket remained empty till the fateful day the name of my lemon coke disappeared. I found myself going from one supermarket to another looking for the precious product. It has even disappeared from the shop of my pakistani friend. but I know the end is close. So here is my tribute to the habits and addictions. For those who have one and accept it and for those who hasn't found their addictions yet. Because I am addicted to so many things and because I love them all.